After the last race the Pornichet Select where I had a lot of trouble on the last upwind part of the race with boatspeed and height, I found my answer during a righting moment test we did the following week. The test included pulling the boat on it’s side to be able to mesure the load pulling upwards on the mast top when the boat layed flat at 90 degrees to be able to optimise our keelangle and keelwheight. With the boat on ti’s side i could see that the cover over the keelshaft was riped open and hanging loose on one side. This cover has no structural function it is only there to cover up the rectangular part of the keelshaft when the keel is extended and canted. I am not to sure if I am happy that i found the reason why I wasn’t fast at the end of the pornichet select or if I should be annoyed by the broken piece. It confirms for me that if I can get the last flaws out of the system the boat can play in the top end of the fleet. The Problem is that the carbon keelshaft has some flex that puts a lot of pressure on the cover and it fails over time. 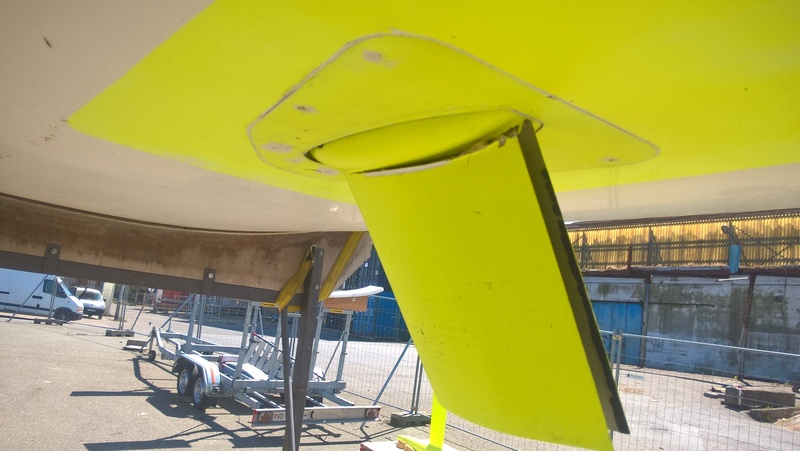 We fight with that problem since the launch of the boat, we tested 3 different solutions already: stiff carbon, fibreglass, soft epoxy… Now we need to find a solution which solves the problem once and for all. Because this takes time I decided not to take part in the Mini en Mai, I regret not doing this race but it is important to solve that issue now to be confident on the Minitransat. This entry was posted on May 9, 2017 by simonkoster. It was filed under Uncategorized . Try vynlester resin mix with white sofa and Kevlar don’t cook!